There’s an often-overlooked device that some photographers say is outdated, but which in fact is just as useful today as ever. This necessity of the film era should still find a place in photographers’ bags, especially those who want total control over their lighting and exposure. It’s the handheld light meter, and it’s treasured by many photographers for its ability to provide precise exposure information for both ambient and strobe exposures. Why, you may ask, do I need a handheld light meter, when the one inside my camera works fine? Well, the answer is accuracy. If you want to be precise and measure everything from lighting ratios to shadow detail, a handheld meter is invaluable. And, if you want to measure strobe light, it’s practically essential. But you’ve got to know how to use it correctly to get all the benefits a light meter offers. Here’s how. 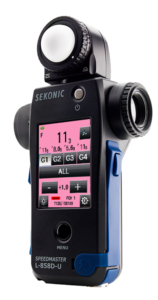 All handheld light meters can measure ambient light—existing light, be it natural or man-made—in a scene. This also includes any constant light source, like fluorescents or LEDs, you may add. Some light meters are also capable of measuring strobe exposures. Most handheld meters, in fact, do this. These meters are sometimes called flash meters. Handheld light meters are recognizable for the little white dome that graces the top of the device. This translucent plastic diffuses the light in order to measure the light falling on a subject—called an incident reading. That makes these devices incident meters. Sometimes the light dome can slide or rotate, be flattened to measure contrast (or light falling on a flat plane) or even be removed to expose the little light-sensitive photo sensor inside. That sensor then can be aimed at the surface of a subject to measure the amount of light bouncing off of the subject, making such a meter a reflective meter. Some high-end reflective meters are called spot meters because of their ability to focus precisely on a selected spot within a scene. These meters have viewfinders built in for accuracy. The TTL meter on your DSLR works much the same way, though it’s not nearly as well suited for things like metering flash and ultra-fine spot selection. Spot meters are measured in degrees; the smaller the number, the narrower the spot and the more precise the measurement. A 1-degree spot is tremendous; 3- and 5-degree spots are fine for general use but maybe not for high-precision applications. In every case, light meters allow you to dial exposure settings in to your camera (which should be set to manual exposure mode) such as ISO, shutter speed and aperture. By setting two of these—say, ISO and shutter speed—and pressing the button to take a meter reading, the meter will display the third variable based on the amount of light it measures. So, for instance, in a bright and sunny situation, if you dial in ISO 100 and 1/125th of a second, the light meter is likely to tell you that the corresponding aperture for the correct exposure is about ƒ/16 (actually a little less, based on the Sunny F/16 Rule). If you had dialed in ISO 100 and ƒ/16, the meter would report back that 1/125th of a second is the correct shutter speed to use. In most instances, photographers will find themselves measuring incident light—the amount of light falling on a subject—with a meter’s diffusion dome in place. To measure ambient light from the sun falling on a portrait subject’s face, for instance, the photographer can simply position the dome next to the subject’s nose and aimed at the camera. The round shape of the dome is meant to approximate the shape of the human face and therefore to provide a meter reading that, from the camera’s position, will provide an appropriate exposure. 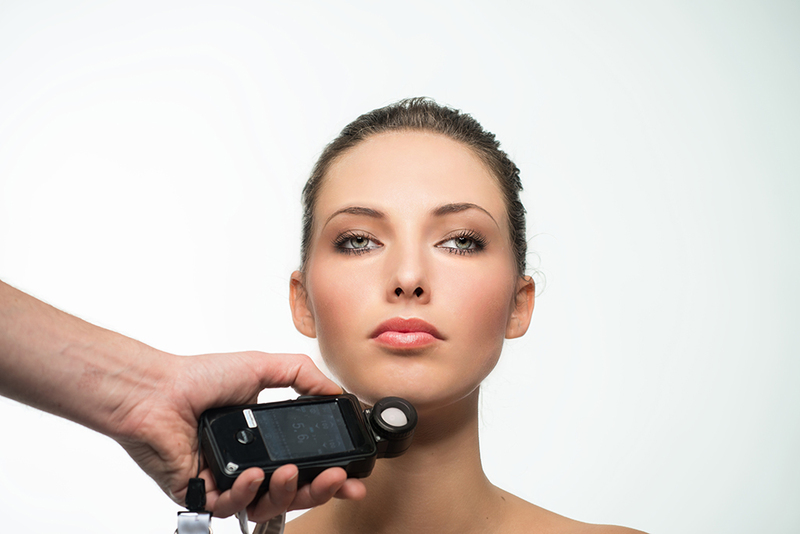 Light from a single strobe may be measured the same way but with the meter set to flash mode. Measuring multiple light sources is really where handheld meters shine. Tasked with this, a knowledgeable photographer can precisely dial in lighting ratios between key light and fill light in order to render the portrait in the style and mood they want. Rather than taking what ambient light is available, a studio photographer in this way takes control of the light in a scene and makes it according to their vision. It’s frankly one of the reasons why light meters are so important; they help deliberate photographers more efficiently implement their creative vision. 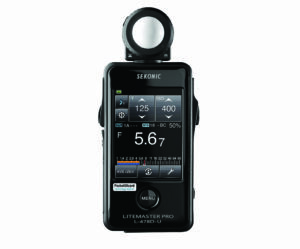 The LiteMaster Pro L-478D-U from Sekonic is an incident meter for ambient and flash with a large 2.7-inch color touch-screen interface. Like its big brother (the L-858D-U), the meter is useful for still photographers and cinematographers for whom frame rates and shutter angles are important. Sensitive in a range of -2 to 22.9 EV, the meter has a memory mode capable of recording and recalling up to eight readings. 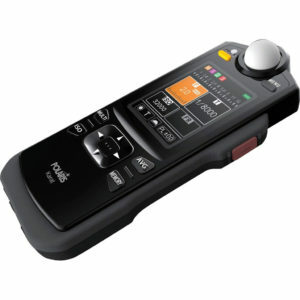 A radio version, which can trigger PocketWizard and other wireless strobe systems, is also available for a $60 premium. 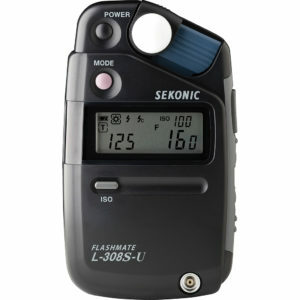 For photographers on a budget, the simple and affordable Sekonic Flashmate L308S-U offers incident metering for ambient and flash. 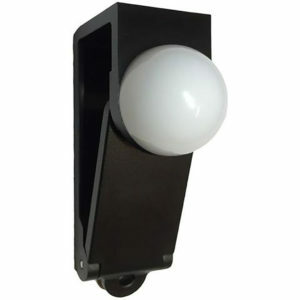 The Lumisphere diffusion dome slides to reveal a 40-degree reflective meter. The L308S-U operates in a range from O to 19.9 EV, and a cinema version is available for an additional $80. ISOs from 3 to 8,000 can be dialed in in one-third-stop increments. Another longtime meter maker is Gossen—a name that should be familiar to generations of photographers. 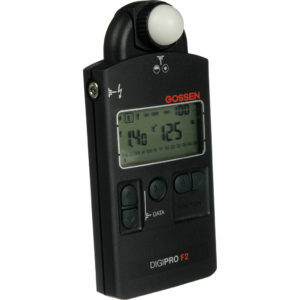 The Digipro F2 is a digital meter that offers both incident and reflected readings for ambient and flash. Contrast measurement, displayed in half-stop increments, indicates whether a scene’s contrast ratio can be handled by the dynamic range of a sensor. The meter also offers frame speeds for cine metering as well, and it’s compact enough to fit in a shirt pocket. 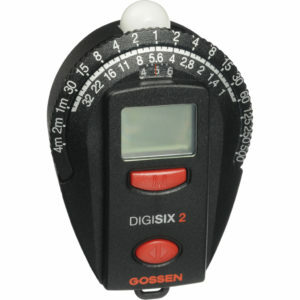 The Gossen Digisix 2 is a compact light meter that combines an old-school look with digital precision. This ambient-only incident and reflective meter measures EV and displays it on the LCD, which is then transferred to the analog setting ring to determine the correct aperture and shutter speed combination. This offers the added benefit of displaying corresponding shutter speed and aperture pairs that will provide an equivalent exposure. The meter also features a thermometer and a watch with timer and alarm functions. For those who want to measure strobe output, the Digiflash version of this meter is available for $15 more. For several years at the end of the film era, the Minolta Auto Meter IV-F was one of the most popular handheld light meters around. The Kenko KFM-1100 Auto Digi Meter continues its tradition with a form factor and ergonomics almost identical to that popular Minolta. This user-friendly meter measures both ambient light and flash, and features a large LCD, which displays apertures in one-tenth and half-stop increments. The “analyze” function is built to meter in mixed lighting scenarios, and the “calculation” function can average measurements that have been stored in memory. Shutter speeds ranging from 30 minutes to 1/8000th of a second, and apertures from ƒ/1 to ƒ/128, are complemented by a cine mode with frame rates from 8 to 128. 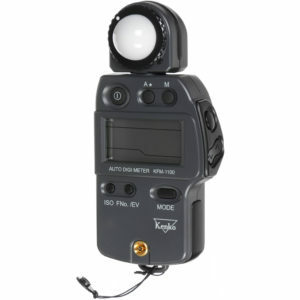 The Shepherd/Polaris Karat Flash Meter comes with a wireless flash trigger and transmitter kit that allows it to automatically fire a wirelessly connected flash at distances up to 300 feet. It also comes with a wireless trigger for use on a camera’s hot-shoe, so switching from metering to photographing is a snap. The meter reads ambient light and strobes in reflected or incident mode, and a flash duration measurement mode is helpful for action photography. Multi-flash mode calculates how many times a flash must be fired to achieve a desired aperture. Smartphones have changed many aspects of photography, including metering. Some smartphone apps allow you to take a picture and determine the exposure based on that image, while other manufacturers are making actual devices to turn phones into handheld light meters. Enter the Lumu Light Meter for iOS devices. Available in two versions, this tiny little photodiode under a diffusion dome connects to any iPhone or iPad that uses a standard 3.5mm headphone jack. It measures incident ambient light and works with any device running iOS 8.2 or later. 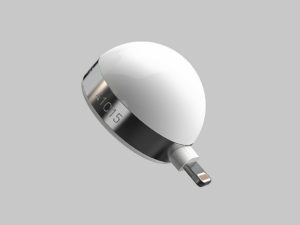 The new Lumu Power, however, ups the ante by not only updating to the Lightning connector used in the iPhone 7 and 7 Plus models, but it also measures ambient and flash with the dome diffuser side of the device. The flat diffuser side can measure color temperature and luminance as well. This is impressive performance from a tiny little package. Another smartphone metering option is the Luxi for All light meter attachment from Extrasensory Devices. It works with phones or tablets, both iOS and Android, up to half an inch thick. The small spring-tensioned device features a diffusion dome that clips on to the phone or tablet to turn a front-facing camera into an incident light meter for reading ambient light. Purchase of the attachment includes a free download of the Luxi mobile app.